Let's take a sober look at this Bloomberg story - here is headline: "Banks Reap Record $9.8 Billion Trading Derivatives". Wow! This is "trading revenue" that includes derivatives and cash securities - all sorts of bonds, loans, stocks, FX, commodities, as well as derivatives. Banks don't have a "derivatives division". Interest rate products may include swaps, caps, floors, swaptions, futures, as well as government bonds and repo. Credit products may include corporate bonds, high yield and distressed bonds, CDOs, mortgage bonds, as well as credit default swaps. Derivatives are tightly integrated with securities. 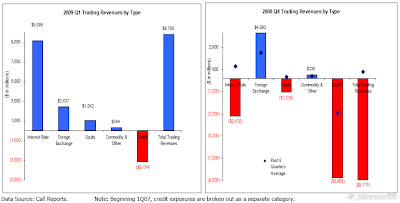 Here is the banks' revenue by trading business from the OCC. One can't really separate pure derivatives revenue. It's also hard to separate how much is market making (taking the spread) vs. proprietary or strategic position taking or hedging. Below is the actual report from the OCC. The moral of the story is don't trust the hype of the headlines - even from guys that are usually solid like Bloomberg. Check for yourself. Update: Note that a reference to "interest rate contracts" doesn't necessarily mean derivatives. Much of it is repo. Asset managers refused to leave cash with prime brokers, lending it to dealers on a secured basis via a reverse repo. The sheer volume of such transactions generated nice revenues for dealers.